It’s easy to get confused about how to please God. One Bible teacher details a long list of the commands you should be keeping. The next teacher says only grace matters. Who is right? Centuries ago, in answer to this question, Jesus simplified all the rules and regulations of the Law into just two great commands: love God and love people. 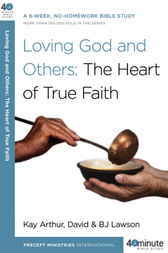 Loving God and Others looks at how these two commands define the heart of Christian faith. As you rest in the certain knowledge of what God calls you to, you will be challenged to live these commands out—and discover how obeying Jesus’ simple commands will transform not only your life but also the lives of those around you. PRECEPT MINISTRIES INTERNATIONAL, founded in 1970 by Jack and Kay Arthur, has trained millions of people to discover God's truth for themselves. The Precepts for Life radio and television programs, hosted by Kay Arthur, reach a worldwide viewing audience of more than 94 million. In addition to inductive study training workshops and thousands of small-group studies across America, PMI reaches nearly 150 countries with inductive Bible studies translated into nearly 70 languages.